This model which sold for about � when first introduced in 1968 remained in production until 1973. Good examples of this radio today are worth in the region of � though you might be able to get one for maybe � The aluminium caps for the band selector pushbuttons often get lost as do the aluminium caps for the knobs. Unfortunately Roberts Radios do not stock replacements, so for this set I made 3 from the ends of discarded eyeliner holders which happened to be the right diameter. Roberts Radio Co Ltd was founded by Harry Roberts in 1932. Their portable radios have a reputation for their high quality. 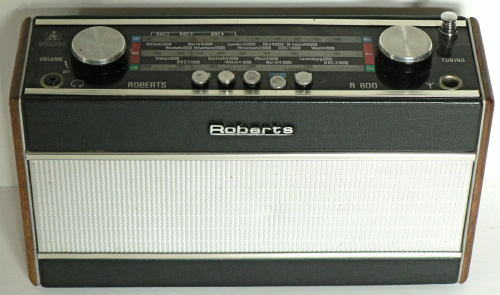 "By Appointment Her Majesty the Queen Radio Manufacturers Roberts Radio Co Ltd "